Biographies of famous people from Stevens Point’s past were shared on yesterday’s Influential Citizen Ride. 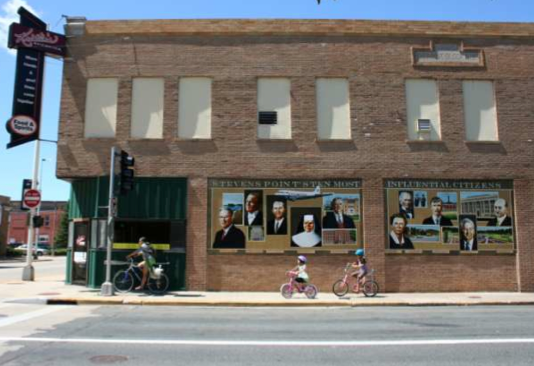 Seventeen Poky Pedalers traveled to locations commemorating Stevens Point’s Ten Most Influential Citizens as determined by popular vote during the city’s 150th birthday in 2008. At each of these locations, a biography of that influential citizen was shared. Poky Pedalers learned how the efforts of these individuals helped to shape Stevens Point and make the city a better place for those living here today. The final stop was to view the mural on Strongs St near Clark St (on the side of Kristen’s Riverwalk) that portrays these ten influential citizens. After hearing about the lives of these ten people, this mural takes on far more relevance. Does your collection include a Jules Iverson trading card? Our Bike Fun was enhanced through the distribution of commemorative trading cards. At each of our stops, each Poky Pedaler was given an Influential Citizen Trading Card briefly summarizing that influential citizen’s biography. I cannot be certain, but I suspect this is the first time that Fred Schmeeckle or Kenneth B Willett or Ruth Gilfry, or any of the others for that matter, have appeared on a trading card. 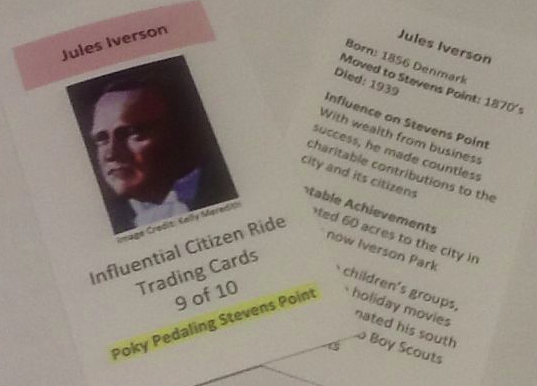 I hope Poky Pedalers who shared in our Bike Fun enjoy their set of 10 Influential Citizen Trading Cards. Maybe they’ll become valuable collector’s items someday. There is still lot’s more Bike Fun to share with Poky Pedaling Stevens Point between now and October. Upcoming Poky Pedals can be viewed here, and the full 2013 Bike Fun Calendar with all remaining Poky Pedals is available here.